These different cells were found in samples from 15 stations in the Amundsen Sea. Only 3 types (red outlines) were sequenced using single-cell techniques but all 3 were found to be the same species. For details see Kim, S.Y., Choi, J.K., Dolan, J.R., Shin, H.C., Lee, S., Yang, E.J. 2013. 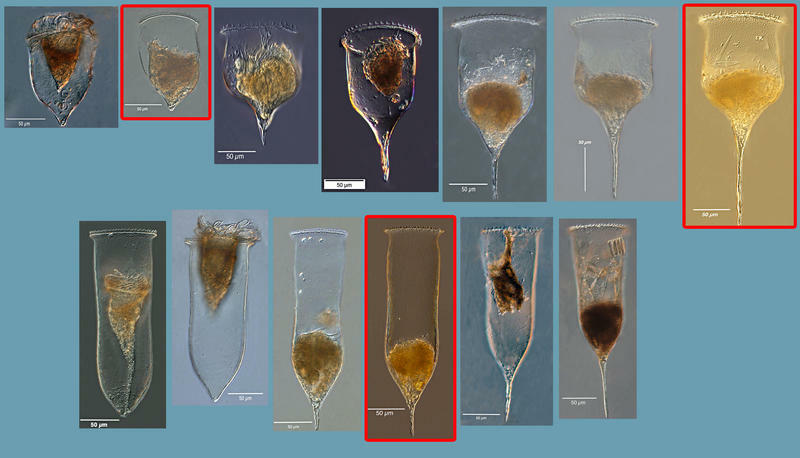 Morphological and ribosomal DNA-based characterization of six Antarctic ciliate 5 morphopecies from the Amundsen Sea with phylogenetic analyses. Journal of Eukaryotic Microbiology, 60: 497-513.